The Hesperia Project:The purpose of the Hesperia project is to develop technologies which enable leading security systems to be created, video surveillance and control of infrastructure operations and public spaces. The project has arisen to respond to a sustained short and long-term demand for it, especially in European Union countries and in the United States. One of the work packages of the Hesperia project is aimed at the creation of advanced user interfaces to help security staff carry out their duty. 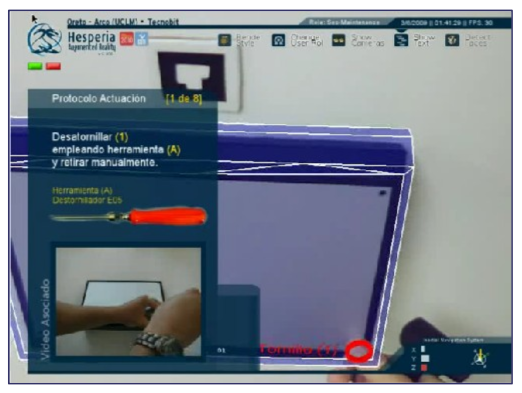 In this area, the Oreto and Arco research teams from the UCLM have developed an Augmented Reality hybrid system which adds contextual information to the user by means of active stereoscopic vision glasses. Control of the system can be carried out by means of voice commands. The prototype in use at present works by means of visible marks which can be replaced by using ultraviolet light-based technologies or by detecting and monitoring natural features in controlled environments under surveillance. The low computing requirements of the system enable it to be transported to embedded platforms. Image of the augmented reality system user carrying out maintenance. Left: final perception of the user with superimposed multimedia instructions for the steps to follow. Use of the global positioning system to show additional information about the room. The information point for the virtual museum is designed for robustness; the system starts up and switches off automatically at a programmed time. 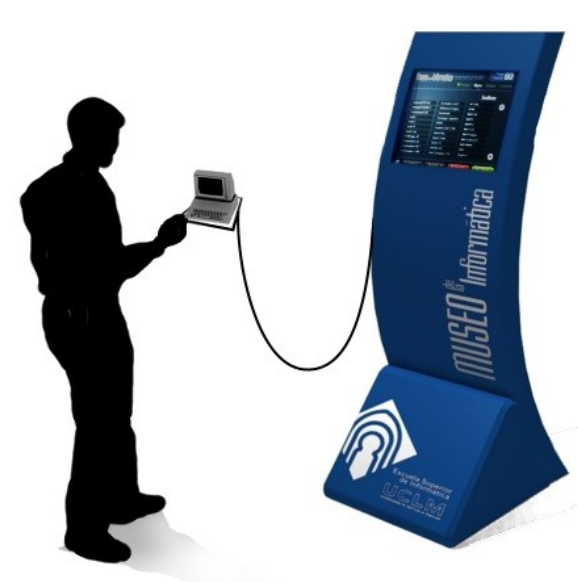 Contents updating is done with an ad-hoc wifi connection, and can be completed without needing to reboot the equipment. If there is a fault with the application a watchdog is entrusted with rebooting it. Since its establishment in 2007, the museum has worked perfectly without needing additional maintenance. At the Computer Science Museum at the Higher School of Computer Science of the University of Castilla-La Mancha, located in the hall of the main building (Fernin Caballero Building), the evolution of different equipment, the history of this young science, which is ever more present in our everyday lives, can be followed. 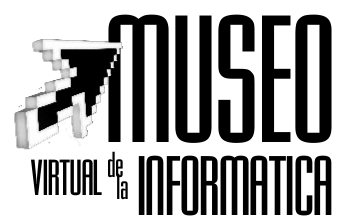 To complete the sample, the Virtual Museum was born with the concept of providing a large quantity of supplementary information, always in multimedia format, which can help to understand the important of how it has evolved in recent decades. In this project there is a descriptive video of the facilities and infrastructure of the new General Hospital in Ciudad Real for use as an overall guide for patients. The complex organization of this building requires visualization of the outside part from a high perspective so as to better understand it. Modelling of the outer part and some inner parts of the building was finished in the first 3 months of the project. 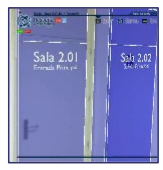 The costly phase of rendering each video still, was carried out using computers from the Higher School of Computer Science at the University of Castilla-La Mancha, by means of the Supercomputing technical support from this institution. The cluster was organized using an adapted version of Oscar. The classrooms where the clusters are used are really teaching laboratories. The subproject Thin-Oscar enabled us to use machines without local hard drives to install an operating system adapted to the rendering needs. The Swap partition of the rendering nodes was used to manage the temporary files used in the rendering process for each project. Each system node was set to obtain the network settings parameters. To do so, the PXE extension from BIOS was used to load the image of the operating system and the suitable rendering software for the project. The results from the research and development carried out in the distributed rendering area and the adaptation of Thin-Oscar to the needs of this area was reflected in the article 3D Distributed Rendering and Optimization using Free Software presented at the FLOSS International Conference in 2007 and was awarded with the Best Article of the congress Award. Elaboration of a reusable gestures dictionary. Focused on achievement of smooth motion and realism. Definition based on capturing movement or using the SEA language Sign Writing. GANAS is structured into three totally independent modules which equip the architecture with features which stand out when compared with other products there are on the market: the dictionary editor, a natural language processing module and a motion representation module. These modules are, in turn, implemented in different layers so as to make them highly maintainable and independent. The representation module uses the results of the previous modules as input. The key positions of the dictionary are situated on a time line and non-linear animation mechanisms are used to compose them correctly. The main bottleneck in realistic image synthesis is the computing time needed to calculate the interaction of the light with surfaces. MAgArRO (MultiAGent Approach to Rendering Optimization) uses the technical principles and concepts of distributed artificial intelligence, the area to which the multi-agent systems belong. Furthermore, the FIPA standard is used to develop multi-agent systems, whilst the middleware ICE is the transversal medium used to implement it. The MagArRo distributed architecture uses knowledge derived from experts in realistic image synthesis to optimize the rendering parameters. Each architecture agent makes local optimizations in the areas of the image assigned to it by a managing agent. MAgArRO uses the concept of estimating the complexity of the different tasks so that partitioning of the load is balanced. The Analyst agent analyses the complexity previously (and independently) to the remaining pertinent steps in the rendering process. The main objective in this fragmentation process is to obtain tasks of similar complexity so as to avoid delays in the time dedicated to it caused by tasks that are too complex. This analysis is done quickly and independently from the final rendering process. Once the importance map is generated, a partition is built to obtain a final set of tasks. These partitions have different levels which are organized in a hierarchy in which at each level the results from the fragmentation process obtained in the previous level are used. 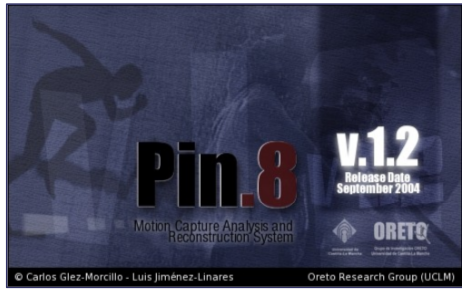 In project PIN.8 a general tool was developed for the automatic identification and repair of errors made in the optical and magnetic capture system. By means of implementing an expert knowledge model based on fuzzy rules the typical errors for each type of motion capture were identified. 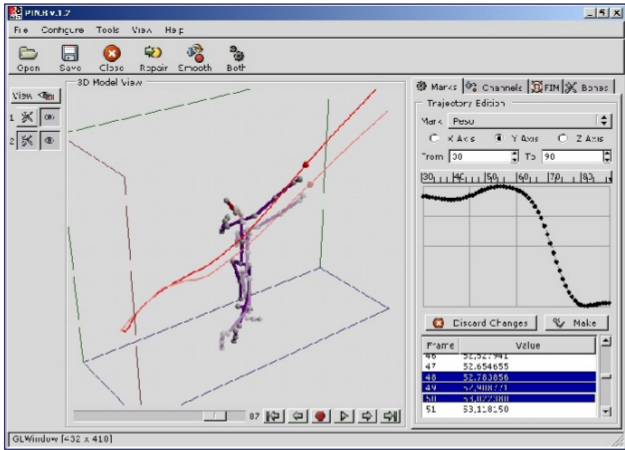 PIN.8 is a generic system that enables any type of motion capture to be processed and works both with real data and data obtained by means of physical simulation. Moreover, it has a hierarchy editor which enables simple representation of any item captured. Additionally, it has an integrated video generation module, so it can be used as a rapid prototype tool for character animation projects. It enables work with a maximum of 16 simultaneous captures and to take measurements between them. It enables videos to be generated with the information there is in the 3D widget and comparative graphics in 2D and 3D. 3D illustration of speed and acceleration vectors. 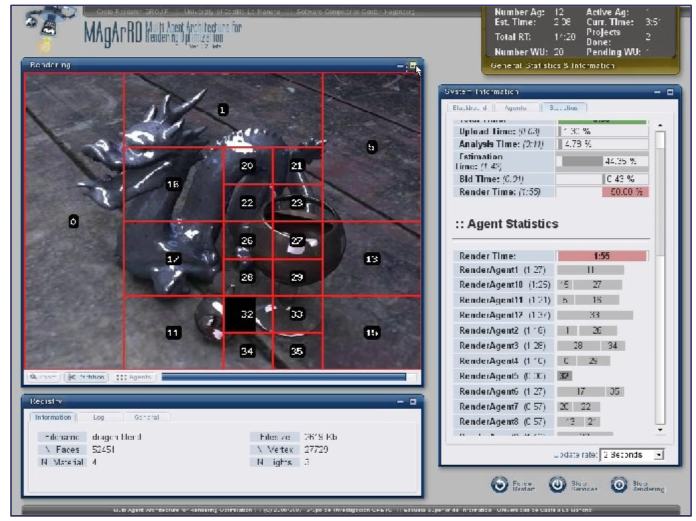 Synchronization tools among captures, representation of historic events and marker scaling. Flexibility with the user interface and possibility of hiding areas of the tool.